Research Update: How did the financial crisis and 4th Industrial Revolution get WEF to rethink competitiveness? It would seem as if two tectonic shifts, one in the somewhat bizarre world of global finance (post the Global Finance Crisis), and the other in the realm of the so-called 4th Industrial Revolution, have finally made its way into thinking on competitiveness. In a major step change from its long established methodology that underpinned the Global Competitiveness Index (GCI), the World Economic Forum’s (WEF) 2018 edition of the index introduces a range of new concepts and attributes geared to measuring competitiveness, and ultimately productivity, to respond to the challenges of the time. 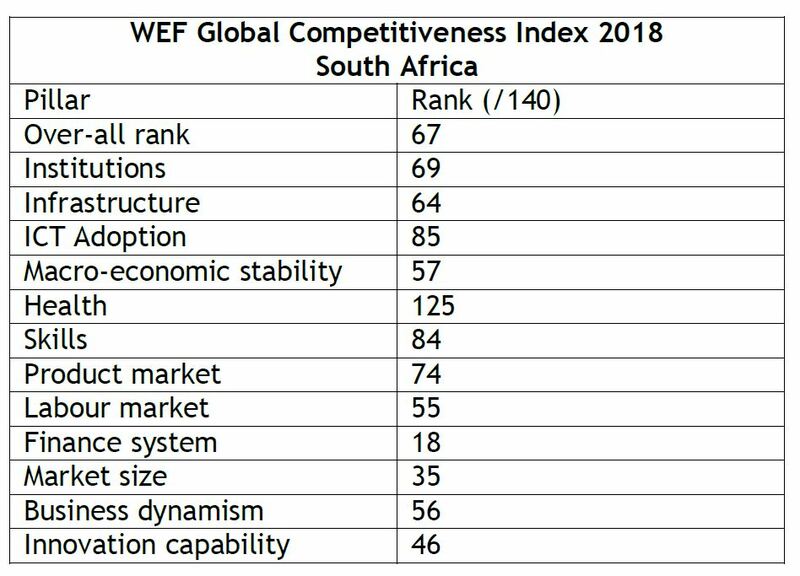 In order to understand and interpret the implications of the new rankings of South Africa, for example, it is at first necessary to understand why WEF embarked on a revision of its methodology. These can be divided into two, being: one, of global political-economic nature, and on the other – due to digitisation and the emergence of the 4th Industrial Revolution. On the one hand WEF argues that the global financial crisis indicates that such events have long-term negative impacts on productivity. The 4th Industrial Revolution on the other hand impacts on the outlook of societies due to disruption of existing business models, and the potential negative impacts innovation can have on society. 4. Adopt Human-Centric approach: ensure that policy and innovation actively protect human centric development approaches. The methodology takes as its point of departure the idea that productivity ultimately drives human development and prosperity in the long term.iii Of the original 98 indicators that informed the GCI, 34 have been retained, and 64 new indicators introduced. It is therefore clear that more than two thirds of the indicators that measured national competitiveness/productivity, have been revised.iv This illustrates the extent to which the two major societal forces (financial instability and the disruptive effects of the 4th Industrial Revolution) have impacted on WEF’s methodology. This section provides some initial thoughts and perspectives on how the changed GCI methodology impacts on the South African Nation Brand’s performance. The table below provides an overview of South Africa’s performance in the 2018 GCI.  In the context of the 4th Industrial Revolution it is notable that South Africa ranks 46th for Innovation Capability. As noted above, being agile and capable to adapt to technological change and innovation, is critical to productivity and survival in a period of rapid change. Much further analysis remains to be done to unpack detailed sub-indicators in the GCI to better profile and understand the South African Nation Brand’s capability to remain productive and competitive in the 21st century economy.